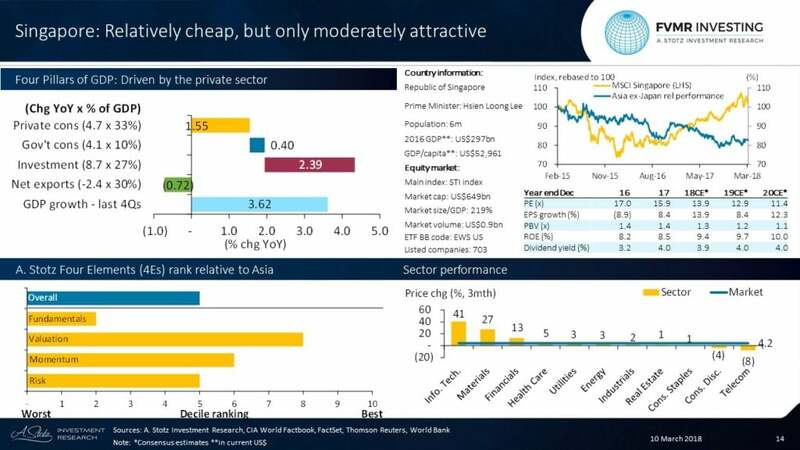 Singapore has moderate GDP growth, driven mainly by private investments and private consumption. Net export was a drag on GDP growth in the past four quarters. Singapore’s 2018CE* 13.9x PE is in line with Asia ex Japan and below ASEAN. EPS growth is in line with Asia ex Japan for 2018CE* but above ASEAN. Nice dividend yield, only Taiwan has higher in Asia. Overall, Singapore appears moderately attractive in Asia considering all our four elements: Fundamentals, Valuation, Momentum, and Risk. Fundamentals: Poor ROE, only Hong Kong has lower ROE in Asia. Valuation: Cheap on PB and second highest dividend yield in Asia. Momentum: Decent price momentum and earnings growth in line with Asia. Risk: Moderate risk in Singapore. Top 3 largest sectors: Industrials: 26% of the market; Financials: 24%; Real Estate: 22%. Best sector & stock: Information Technology: +40.6% & Hi-P International Ltd: +49.8%. Worst sector & stock: Telecom: -7.6% & StarHub Ltd: -13.6%.